Today, over forty years after the Voting Rights Act of 1965 demolished bars to voting for African Americans, the effort to prevent black people—as well as Latinos and the poor in general—from voting is experiencing a resurgence. A myriad of new tactics, some of which adopt the mantle of “election reform,” has evolved to suppress the vote. In this sharply argued new book, three of America’s leading experts on party politics and elections demonstrate that our political system is as focused on stopping people from voting as on getting Americans to go to the polls. In recent years, the Republican Party, the Bush administration, and the conservative movement have devoted a remarkable amount of effort to controlling election machinery (the scandal over federal prosecutors was in part over their refusal to gin up election-fraud cases). 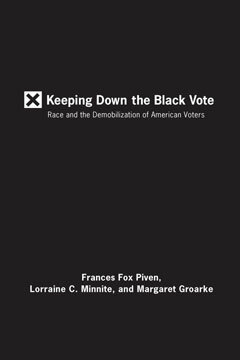 But Keeping Down the Black Vote shows that the effort to rig the system is as old as American political parties themselves, and race is at the heart of the game. Lorraine C. Minnite is an assistant professor of public policy at Rutgers University–Camden. She lives in New York City. Margaret Groarke is an associate professor in the government department at Manhattan College. She lives in New York City.